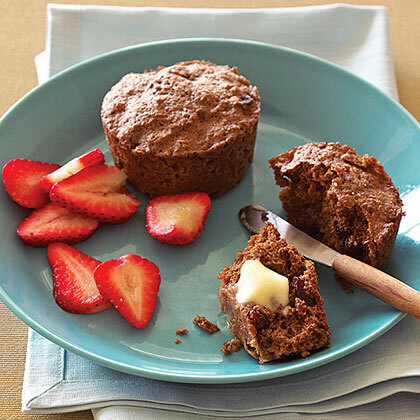 Make this batter early in the week, then scoop and cook a muffin every day for a healthy breakfast in a flash. Mix together both brans with 1/4 cup boiling water in a large bowl. Let cool. In a small bowl, combine oil, honey, molasses, milk, and egg, then stir into bran mixture. Add flour, baking soda, salt, spices, and dried fruit and stir until just combined. Spray a microwave-safe 1/2-cup bowl or ramekin with cooking spray and spoon in 1/4 cup batter. Microwave until muffin springs back when touched but isn't hard, about 45 seconds for a single muffin or 90 seconds for 4 muffins cooked together. Repeat with remaining batter. Make ahead: For batter, up to 4 days, chilled.